2018 is rolling up to be a nice planning year and never have I had more visibility to where I need to be to meet my goal of retiring at age 60. The second major event occurred by accident when I was trying to determine how much emergency cash I would need during retirement (see blog post This is 3x Worse Than a Market Crash) by analyzing how my portfolio would have done in a crash using the 2009 great recession as a data point and later a supplemental analysis of how my portfolio would perform in a long sideways trading market with high inflation using the 1970’s as a data point. What resulted was that I was off on my original goals and needed not to replace 100% of annual expenses with passive income but it needed to be 115% of annual expenses and I needed at least the equivalent of 9 months of expenses as emergency cash. Note, when I calculated passive income I am using a 20% tax rate so my pre-tax passive income is even greater. This threw me a slight curveball and suddenly it was not as an easy goal as I thought in last March. Now my modified goal requires an annual dividend growth rate of 12.5% and I need to save an additional $2,000 annually in cash for emergency money during retirement. The 12.5% growth rate might be achievable but an additional $2K may be a challenge. After all of this, I now have refined long term retirement goals for age 60 and annual goals for 12.5% growth & $2K cash. 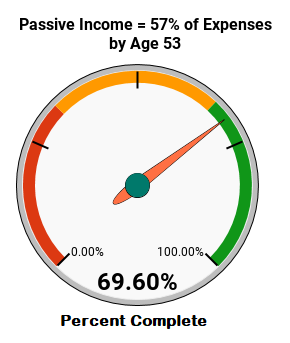 With this I decided to add an interim 3 year goal (by age 53) to have after-tax passive income equivalent to 57% of expenses. Using Google Sheets “Gauge” chart and here is the end product. Truth be told, planning for long term goals (20+ years) is not an exact science. The further we go out in time and try to predict something the greater chance of miscalculations. I have always planned on retiring at 60 but my financial goal targets for age 60 continuously changed. Now that my long term goal has turned into a mid-term goal (10 years), my ability to plan more precise financial goals is coming into play and getting me excited as I have the possibility to achieve what I have worked long and hard for.